In itself, the so-called fiscal cliff was always a poor metaphor, as if the nation’s economy was dangerously close to a fatal dive. There were some perils, but the fundamental implication of inaction would have been for the White House to get a clean slate for 2013. I assumed, wrongly it turns out, that President Obama would intentionally fail to reach a deal with Republicans in Congress because his incentives were weighted heavily that direction. Instead, a Senate deal and a conflicted House GOP led to a last-minute agreement. The House voted in favor of the Senate deal last night. On its face, the resolution is a major Obama win, but I really think that’s all wrong. Think about Obama’s incentives. Polls say that Republicans would get the bulk of the blame if no deal was reached. The sunset of all the “Bush tax cuts” meant that the White House would immediately reframe the fiscal conversation as a package of Obama proposals. The DC punditry would have spent the next many, many years talking about these as “Obama tax cuts” which is not a bad brand for the Dems to build on. Third, the sequester of defense expenditures is something that many extremists on the left dearly desire, and I am not sure the President disagrees. He got none of this. Instead, he’s played his ace card: his singular identity of wanting to tax the rich more will soon be law of the land. For what? Kicking the sequester can to March 1?True, tax rates went up on the rich, but again, that ace card has now been played. It cannot be played again. Perhaps Senator McConnell outfoxed them all. Perhaps Obama thought that forcing Republicans to vote for tax rate increases on incomes over $400,000 per year with nary a spending cut was such good politics that it was worth locking in bad economics. The whole thing seems like a wasted opportunity to me, as it does to many others (see Bob Samuelson, Bill Gale, and Mssrs. Bowles & Simpson). It’s a shame that Speaker Boehner is taking such a beating from all sides because his actions, to me at least, show more leadership than almost anyone. His incentive was to get a deal done, a genuine compromise. Boehner’s Plan B, and surely his private offers as described in press reports, embodied the principles of good, wonky, bipartisan, fundamental tax reform. Deduction caps to raise revenue! Great idea! Modifying inflation of entitlements to actually reflect real inflation and trim the growth of entitlements. Great idea! While the President promised the poetry of “Balance,” the Speaker actually made offer after offer with equal parts revenue and spending cuts. All this goodness was spurned by the White House, to its shame. What stinks about the final bargain is that it reveals a President unwilling to countenance even the mildest of spending restraint in the most severe crisis with the most compelling economic environment. The fiscal cliff metaphor is overrated, but the long-term fiscal crisis is not. The cost of the ATRA bill, according to the CBO, is an additional $3.6 trillion in debt over ten years. The nation sits atop a mountain of unstable debt dynamite, and every year more is added to the mountain. A trillion dollars per year, funding principally by artificially low interest rates due to monetizing by the Fed. How long can the Federal Reserve bail out the fiscal ship of state? Maybe Obama thinks the Fed is his ultimate ace card. But when the crisis comes, when the bond market hesitates to buy new T bills with vigor, the President and the nation will be caught empty-handed. How can you display leadership when you can’t control half the members in your own party? He is a horrible majority leader. It seems that you acknowledge that the higher taxes caused by the cliff would have hurt the economy, possibly pulling us into recession. At the same time, you also ridicule the President and Dems for cutting taxes which would cost $3.6B over 10 years as the nation sits on an unsustainable pile of debt. Thus, at first, you say the cliff would have been bad, then you say that the debt is bad. So which is it? You can’t have it both ways… and you can’t say spending cuts as the solution, b/c you know that cuts vs tax increases impact the economy similarly, both taking money out of people’s pockets. Are you recommending higher taxes, lower spending, and a balanced budget but also a recession? Or are you advocating lower taxes but a high deficit? Seems to me like you don’t realize the two republican talking points contradict each other. Of course, the funniest part of the article is your “unstable debt dynamite” which conservatives have wrongly been saying would cause massive inflation and interest spikes for years. Bill Gross just said it again today. Any day now Bill! The fed doesn’t own all of our debt, so in a free market, everyone would think our debt is overpriced and sell their holdings considerably overwhelming any fed attempt at buying. The extra fed demand is not holding back rates, just like rates didn’t spike in the summer of 2011 when the fed stopped buying for a few months. Sydney, thanks for the comment. I’ll make this simple: Cut the growth rate of spending. Second, reform entitlements (Would it be so bad to give everyone equal payments from Social Security? Talk about funny — most politicians support means-testing to give the wealthy elderly no benefits AND support the current regressive structure, BUT oppose simple equality. That’s totally irrational). 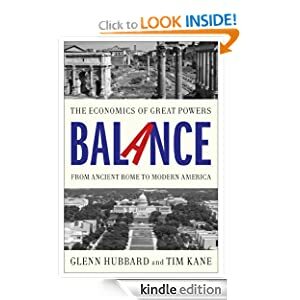 Furthermore, Glenn and I recommend a balanced budget amendment that is politically neutral as well as a handful of other process reforms. Will explain more in the book.